Ok, nobody cared who I was or even noticed I was there, but this was a fantasy that I wasn’t going to let slip by without indulging. The first thing I was quickly reminded of was-this is high school basketball, Ken. The pubescent kids, the gymnasium bleachers, the corny Marky Mark cheerleading routines-they were all a nostalgic shock to the system. Moses Morgan plays for a talented 4-1 team in an untalented region. The competition in Las Vegas is not great, so keep that in mind. That being said, Moses dropped 32 pts in the first game and around 20 in the second game I attended. Surprisingly, he isn’t the best shooter on the team. He isn’t the best ball-handler on the team. He isn’t even the most athletic on the team. But he’s probably the best all-around player, and certainly the most highly recruited. Moses is an interesting specimen for several reasons. The boy was the tallest kid on the floor both nights I was in the stands, yet he doesn’t play center. On ESPN’s scouting report, he is listed as a 6 foot 5 shooting guard. Well, he definitely isn’t filling the role of a shooting guard on this team, and he seemed more like 6’6 or taller when I stood next to him. He is the most equipped to play in the post, but you don’t see him there often. In fact, they don’t even put their biggest guy on him. It’s just not needed. That’s not where he’s roaming. I can see why, because in the few instances that he found himself suddenly guarding their center, he got pushed around. He just doesn’t have the frame yet, and will need to hit the weight room hard in his senior year. I also don’t think he likes banging down low. “Well,” you say, “he must be a streaker then or an off-the dribble scorer?” No, he isn’t that either. This isn’t a Manny Harris type. If I had to classify Morgan’s game, I would call him an opportunist over a creationist. A creationist being Manny-someone who can create his own offense. You give him the ball at the top of the key, a little space, and he’s going to take it to the rack for an “and 1”. Moses Morgan is an opportunist because he lets the scoring come to him. He only really scored in 3 ways: he sat outside the arc and got open 3 pointers (hit about half of them), he finished on fast breaks, and he grabbed a lot of rebounds for easy put backs or was hacked and sent to the line. The rebounds and fast break conversions really just resulted naturally from him being the most physically gifted against weak competition. The 3 pointers resulted from him actually having really good touch as a shooter. I saw him go 16-16 from the stripe in the first game. His stroke was pretty and he could hit a jumper from anywhere on the floor. Although, he never really had a hand in his face. I don’t think the other team really understood why he wasn’t dominating down low and just lost track of him around the perimeter. 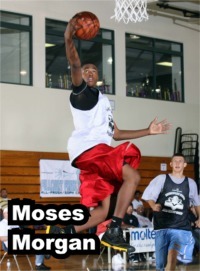 Moses also showed some nice touch with floaters in the paint or when trailing on the fast breaks. I never saw him dunk. Just not the highflying type. This leads me to the central point of my little amateur report here. He seems like a great prospect from afar and is rated in the top 60 in the nation, because quite frankly, he puts up the stats. I can even see why Beilein likes him, because the kid is a good shooter for his height. If you ask me, however, (and nobody is) I don’t see how he meets expectations in the conversion to college basketball. He’s not a guard, because he doesn’t have great ball handling skills and doesn’t try to run the offense. He’s not a 4 or 5, because he doesn’t have the meat or power game. Is he a 3 then? Well, he reminded me of Anthony Wright more than anybody else, so take that for what it’s worth. I think he would end up being a similar player to Ant with a higher field goal percentage. The awkward “tweener” problem would remain. The defensive intensity seemed adequate, and he would probably be good for the 1-3-1 with the ultra-wide wingspan, but not a standout defender by any means. Mentally, the kid is a quiet leader on the floor. He keeps to himself mostly, and from talking to one of the parents of another player, is a really good kid. I bought that, but almost had to think twice when Moses was called for a technical foul towards the end of game 2. Basically, he put a “get that crap outta here” block on the opposing 5’10” point guard, sending the kid to the floor. He then proceeded to saunter over him like football players do after a big hit. Was he trying to help him up? The referee didn’t think so. Let’s be honest. The kid is only a junior and there’s no doubt that I am probably being too hard on him, but I’m just calling it like I see it. Moses Morgan is a highly productive stat machine in a weak state and has probably been a little overrated. Maybe this is just what juniors in high school look like. If he is to get me excited, he needs to build some muscle and figure out how to create offense when your team needs a bucket and everybody is keying on you. The flat-footed, Stretch Armstrong rebounds, easy put-backs, and wide-open 3s aren’t going to be there at the next level, son. Luckily you have plenty of time to show you belong in the upper echelon of recruits and worthy of a scholarship on what will be a deep 2010 Michigan team. 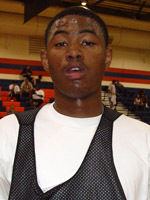 I’ll continue to monitor Morgan’s play (especially next year) as long as Michigan seems serious about his recruitment. I should also have some film footage available in a few months, courtesy of one of the Palo Verde mothers. Thank you for listening and GO BLUE!! !